June is not only a special month because of all the weddings we are a part of, but it’s also very special because of the other very big day in a person’s life – high school graduation. In the US, it’s more customary to call it prom (which is short for promenade), but in British Commonwealth countries such as Canada and Australia, the party that take place for high school seniors often referred to simply as grad. 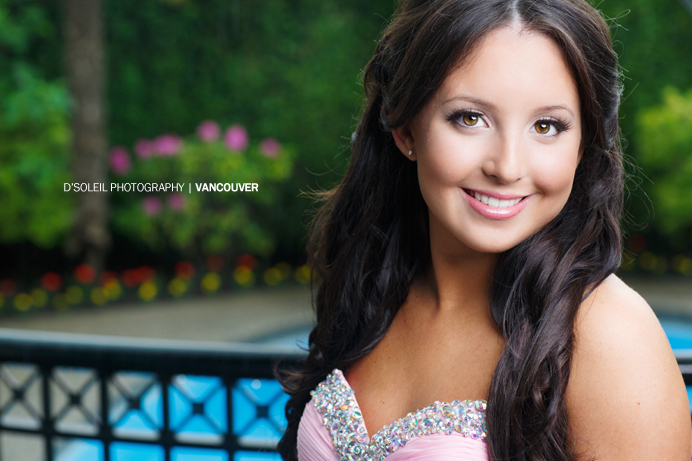 Visit the popular parks in Metro Vancouver such as Queen Elizabeth Park and you will see crowds of senior grads in their best grad dresses and tuxedos taking photos of each other and with friends and family before heading to one of the biggest and memorable parties of their young lives. Grad parties usually start off as formally planned events by the high school or grad committee, but it’s really the after parties that are often the most memorable and these parties often continue into the early hours of the next day. For Lindsey, her graduation party began at home where her closest friends were treated to an exclusive afternoon pool-side party. 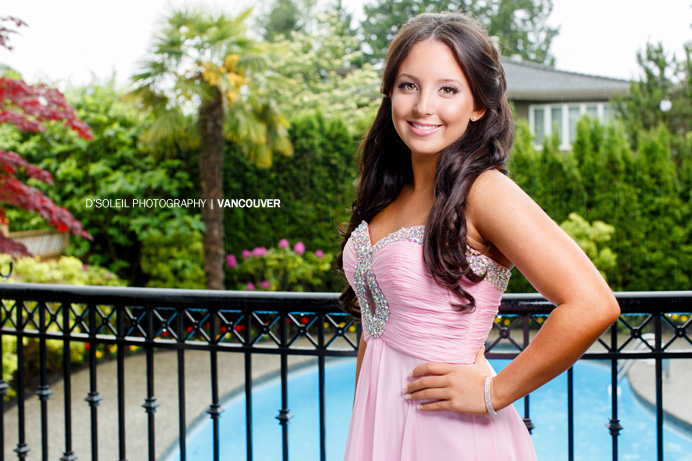 Lindsey’s mom contacted me to do some formal portraits of Lindsey in her grad dress and also photos of her grad date before guests arrived. We had hoped for sun during the grad photos, but afternoon showers limited us photos around the covered areas of her estate. Fortunately for Lindsey and friends, the sun did finally peek through later that afternoon, just as Lindsey had hoped. Above are a few photos from the grad portrait session before the party. Next Post A walk along Jericho Beach | Vanessa + Adrian Vol 1.